There we were, two couples sitting around a table at 10 o’clock on a beautiful but sultry Monday morning playing cards. Our only objective was to win the game. Nana Neva and I had taken an extended weekend break from our part-time grand-parenting duties to explore a less-familiar area of Virginia with another retired couple. We had worked all of our lives to reach this point. Playing cards followed by a round of dominoes seemed like the perfect way to begin a new week, especially on a hot and muggy morning. We played until lunch and then walked down the slanting limestone driveway to a cozy eatery in a marina for some fabulous homemade ice cream. Choosing which flavor became the toughest decision we made all day. The location had much to do with our buoyant attitude. We had rented a cottage situated on a point overlooking a man-made lake where the dam generated hydroelectricity. 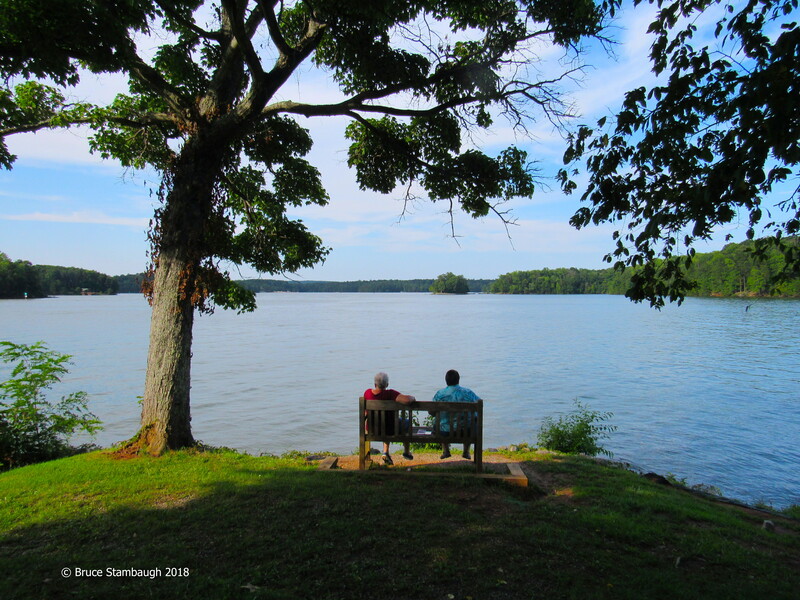 The lake was long and narrow, the product of a few creeks damned up to fill steep valleys in southern Virginia. Such a project brought more natural benefits than producing power. Wildlife thrived. Each morning and evening a resident bald eagle perched on a favorite snag, often on the same limb a quarter of a mile across the bay from us. We had a perfect view from our deck that faced the water, made murky by a series of recent heavy rains. 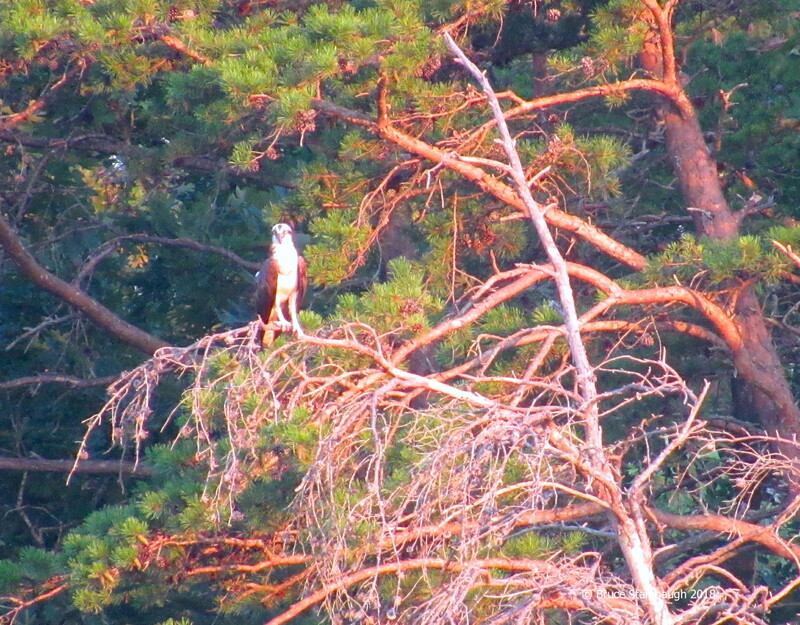 Before breakfast, I spotted an osprey perched on a dead pine farther up the narrow bay. The “fish hawk” stood tall and stately in the morning mist. Pileated woodpeckers called and flew back and forth across the water, too, landing if only briefly in the sizable wild cherry tree in our front yard along the shoreline. An eastern kingbird, a much smaller species, chased the much larger woodpecker upon every approach. Fierceness is the kingbird’s nature. The ripe fruit of the lakeside tree drew songbirds, too. The kingbird didn’t seem to be as bothered by the Carolina chickadees, tufted titmice, red-bellied woodpeckers, and even young redheaded woodpeckers. I could have stayed there all day to watch that show. The previous day we ventured to Rocky Mount, the county seat where my maternal grandparents were born. We researched family records in the historical society. The lilt and soft, southern accent of our hostess could have been my grandmother’s. In the process, I was a boy again, standing in the hot Virginia sun inserting a nickel into a parking meter for my father. Dad had to finish the task because I wasn’t strong enough to turn the knob so the coin would activate the meter. The street meters have long disappeared, just like the department store where a relative had worked. We visited the Booker T. Washington National Monument where the famous educator was born and freed as a slave. The sweltering heat and humidity made it easy to envision the slaves toiling in the parched fields. 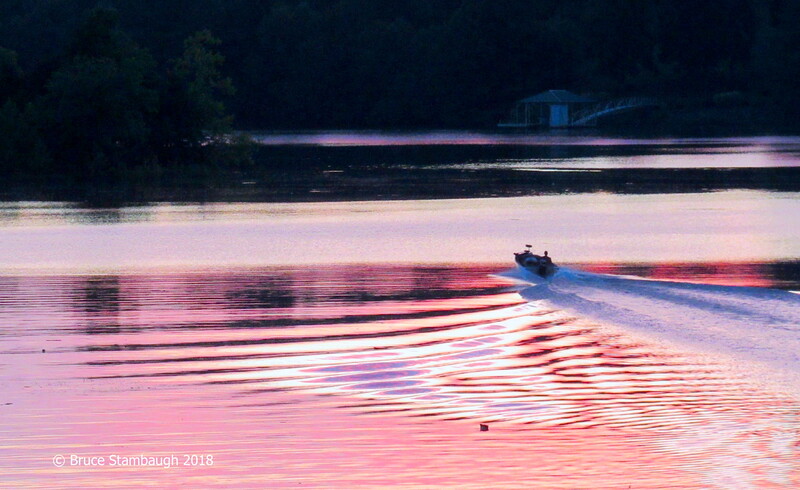 Back at the cottage, boats rippled the reflected sunset as they headed in for the evening. Spiders devoured gnats trapped in the delicate webs on the deck just as a young eagle glided across the dusk’s burnished light. This is what retirement was meant to be. We are grateful to be at this phase of our lives. That said a palpable quietude subdued any thought of celebration. Too many others would not know the same joy and appreciation. Empathy should temper our golden years. Compassion must rule the way to ensure a purposeful retirement.